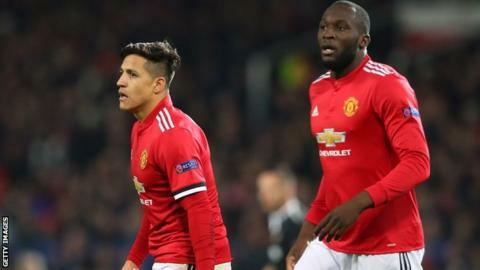 Manchester United interim boss Ole Gunnar Solskjaer hopes forwards Romelu Lukaku and Alexis Sanchez can "step up" as the Red Devils could be without nine senior players against Crystal Palace. Ander Herrera, Jesse Lingard and Juan Mata were injured during the first half of Sunday's match against Liverpool. Marcus Rashford played most of the 0-0 draw with an ankle injury and is a doubt for Wednesday's fixture. Teenagers Angel Gomes, Tahith Chong and Jimmy Garner will be involved. Gomes, 18, is the only one of the academy trio to have made a Premier League appearance. As well as Herrera, Lingard and Mata, United will be without defenders Phil Jones, Antonio Valencia and Matteo Darmian, midfielder Nemanja Matic and forward Anthony Martial at Selhurst Park. Argentina centre-back Marcos Rojo, who has made just three appearances this season, will also be involved after returning from a long-term injury. "There are not a lot of positives," said Solskjaer, who is waiting to see how Rashford responds to treatment on his ankle. Solskjaer told MUTV the England striker's injury was not made worse by playing the full game and it was "not as bad as we first feared". "We're going to work on him for as long as we can to see if he gets ready," he said. The Norwegian said Wednesday's game gives Lukaku and Sanchez "a chance to play to their potential". "The two get on very well," he said. "Hopefully Alexis and Romelu can step up. We will have a good team out on the pitch." Martial was injured during the home defeat by Paris St-Germain on 12 February, and Solskjaer said the Frenchman could return for Saturday's home Premier League game against Southampton. Lingard replaced Mata during Sunday's game but lasted just 18 minutes before suffering a recurrence of a hamstring injury. "Jesse was eager, ticked all the boxes, maybe it was a couple of days early," said Solskjaer. "It was Liverpool. He was desperate to play." United go into Wednesday's game fifth in the table, a point behind Arsenal in fourth.